Something’s stirring beneath the cobblestones and grey pavements of my hometown, Oxford, England – the roots of a people’s food revolution. In small and separate ways people are taking a stand against the corporate giants of grocery shopping. I asked four of these people what motivated them. 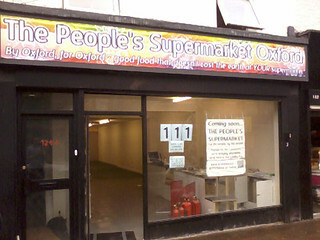 Chris Waites initiated Oxford’s “People’s Supermarket” which opens Saturday on the cosmopolitan Cowley Road; its members share ownership of the co-operatively run grocery shop and volunteer their time to run it. 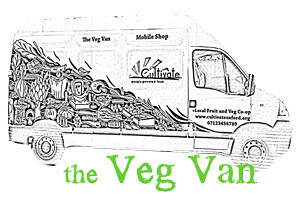 Doireann Lalor is a founder member of Cultivate, a “people powered food” co-operative that sells homegrown vegetables from a roving van. Rupert Griffin is a founder of the East Oxford Farmers & Community Market where he sells homemade juice from windfall apples. And Katie Chester is part of a group planning a community market on Blackbird Leys, a government-subsidized housing estate. Chris Waites stands in front of the post author’s Just Change mural. 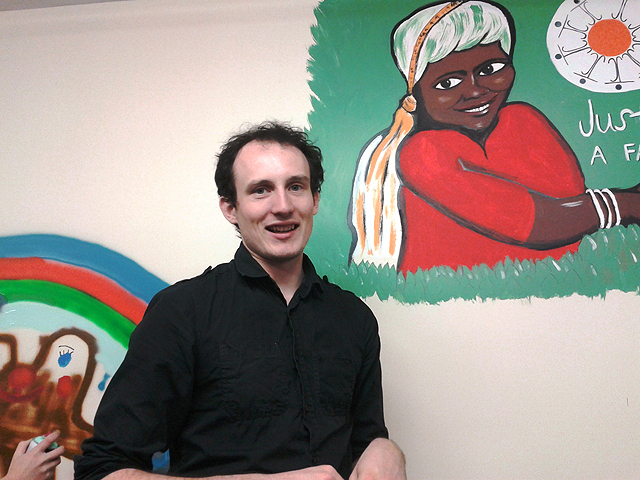 Chris told me “My biggest motivation in starting the People’s Supermarket in Oxford, is that I hate waste. When I was a kid we had no money. We got what we could from the land. We even ate nettle soup – it’s free, healthy and delicious! The acid that makes it sting gives it a tangy flavour. I still love it and drive my wife mad by picking nettles whenever we go out for a walk! Food is too important to trust to faceless companies like supermarkets. The main four waste 50kg of food on behalf of each of us every year. This is a way for us to take control back. It’s food and music that bring the community together. I think people have got fed up with the way supermarkets manipulate prices, making them double one week and half the next. It’s not sustainable for the future. The economic crisis was a wake-up call. But it’s not just my supermarket – there are 122 other owners of this shop with me.” Of which I’m proud to say I’m one. Rupert is my parents’ neighbour. He puts the windfall apples he collects from the Oxfordshire countryside through a hand press in what was my grandmother’s garage, creating a range of juices as varied in flavours as fine wines. He then sells them at the East Oxford Community Market, a finalist in the Finalist in the BBC Radio 4’s 2011 Food & Farming Awards. Katie was also motivated by the power of food to bring communities together, which was the predominant reason given by people surveyed on the Blackbird Leys estate for why a community market would be a good idea. Supermarkets have dominated our grocery shopping for decades. But perhaps deep in the heart of an organic turnip on an Oxford allotment, or in a Blenheim Orange apple fallen amid the nettles, the worm is turning – and food really will be reclaimed by the people for the people. Vive la révolution!